SmuggleCraft features a few different AI CPUs; Racers, Police, and Bounty Hunters. Here I will discuss how the Bounty Hunters were originally envisioned, how they differ from Police in mechanics, and how they got to where they are in the game today. Bounty Hunters, like Police, chase the player when in range, and attempt to damage or prevent them in some way from completing their mission. 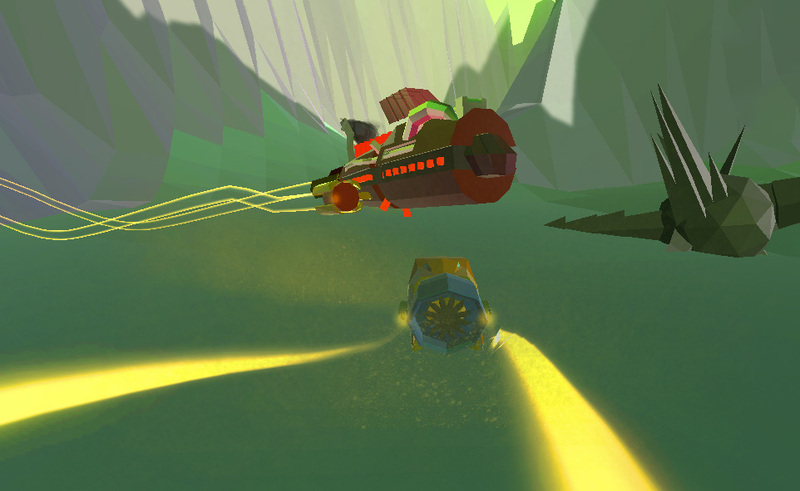 Bounty Hunters travel in “packs” instead of alone, and begin pursuing the player immediately, driving backwards on the track, instead of waiting for the player to pass them like Police. Originally we also wanted them to move in a formation, similar to how pilots might fly together. Each pack had a leader, and depending on the number of Bounty Hunters spawned in a pack, the leader would randomly assign a formation that they all would follow. Due to the nature of the AI, and how they were designed to drive, formations were proving very difficult to do, and to makethem look believable. We wanted the AI to feel more human, we want them to make mistakes, take different paths, and drive in real time using their surroundings to dictate actions and speed. Trying to force their “imperfect” driving into perfect formations was a challenge. We were able to achieve the effect through a lot of forced movements, and in doing so the AI were no longer driving themselves, simply being forced into a position dictated by the leader’s driving and assigned formation. After a lot of experimentation, we decided to change the way they work. By giving them a few simple rules to follow, a list of priorities rather, and allow them to drive on their own. To keep the feeling ofthem being in a pack, the top priority was to stay around the average position of the other pack members. If one member was ahead of the pack, it would slow down to allow the others to catch up, if one was behind, it would increase its speed. Once they were all in this general radius of each other, they would drive at the same speed. Thisallowed them to stay together as a group, but with full control of driving and making their own decisions. When the pack reaches the player, they start to attack. Instead of them shooting an energy beam like Police, we wanted them to do something different. What if they charged at the player? Made themselves the bullet! This was a cool idea that heavily separated them from Police. The pack members take turns charging at the player. During this attack, they create a shield making them invincible to damage, and when the attack is finished, it tells the next pack member it is their turn to strike. This kind of system makes it feel like they are working together to take the player down. The Bounty Hunters went through a lot of trial and error to get where they are today, from forced movement in formations, following only the leader of the pack, to self controlled group aware driving. I’m sure they still have more work in store to make them perfect, but I think they are on the right track! It’s with equal parts 🙁 and 😀 that we announce that, after 6 years, Carol Mertz is leaving her position at Happy Badger Studio and Rampant Interactive. Carol is one of the co-founders of Rampant, and has been an integral part of the growth and creativity of both Rampant and Happy Badgers and their many projects. Dana Huth and Ben Triola, the remaining partners at the studio, don’t intend to replace her position and will continue to operate both studios with the same level of momentum and enthusiasm as always. Carol is taking a position with St. Louis-based game development studio Butterscotch Shenanigans this summer, where she’ll continue to flex her business and community development muscles. She’s excited to expand her experience within the game industry, and is looking forward to all of the adventures to come. In celebration of the time Carol has spent with the Rampant team, we’d like to reflect on some of the wonderful things we’ve done together. Carol co-founded Rampant Interactive with Dana and Ben in February 2010 as a client-facing creative studio. In 2013, the team acquired game development company Happy Badger Studio, and regularly began working on creative game projects alongside the interactive client work through Rampant. From 2010 through 2016, the team at Rampant Interactive has produced over 70 websites, developed numerous apps, and published over a dozen games. Highlights include work for the Pulitzer Arts Foundation, The Post Sports Bar & Grill, Centene Corporation, Anheuser Busch InBev, Saint Louis Science Center, designer shoe brand Luichiny, and Strange Donuts, among many others. Rampant will continue to seek out challenging, interesting, and occasionally bizarre projects through which we can apply our collective passion, creativity, and vision. We’re all excited for what the future holds. “Pass the Buck: A Game of Corporate Responsibility Management” is now on Kickstarter! We’re SO excited to announce the first-ever card game to be published by Happy Badger Studio! It’s currently on Kickstarter right now, so please check it out. It’s a satirical, hidden-role card game called “Pass the Buck: A Game of Corporate Responsibility Management,” designed by our very own studio partner, Carol Mertz. If you’re into bluffing, laughing, and making fun of corporate America, you’ll love this game. Please help us out by backing, sharing, and overall sending positive vibes — we’re really hoping to make this game a reality. At Happy Badger Studio, we may be best described as “experienced beginners” when it comes to promoting our games. We’ve been making games for four years, and have had the opportunity to exhibit at a few St. Louis-based conventions and a number of other small local demo events. Even so, we know that we still have a lot to learn when it comes to operating a successful demo booth at a large-scale expo. As development of our latest game, SmuggleCraft, has gained momentum, we’ve begun to seek out ways to expand our horizons and put the game in front of players and press on a more national level. 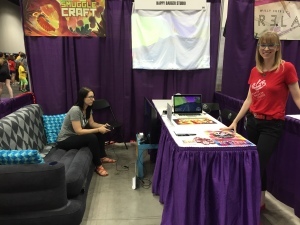 When one of Indy PopCon’s organizers reached out to our local game dev community about available booth space, my team and I at Happy Badger Studio made the big decision to take SmuggleCraft out-of-state for the first time to PopCon in Indianapolis, Indiana. We’ve never shown any of our games outside of our hometown of St. Louis, MO, though we do have the benefit of a few years of local convention experience. We felt PopCon would be a good first out-of-state event for us, based on the event’s relatively close proximity to St. Louis (4ish hours by car), the reasonable cost of booths, and the moderate (but not overwhelming) scale of attendance. We were also enticed by promises of guaranteed stage presentation time, opportunities to connect with press and Let’s Players, and automatic entry into the convention’s Indie Reboot Awards—all good opportunities to fulfill our ultimate goal of increasing awareness and finding new press contacts. 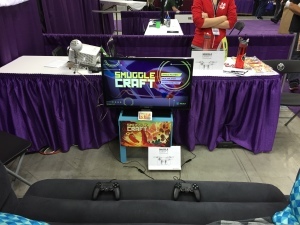 SmuggleCraft at Anime St. Louis. DEMOING IN THE LAP OF LUXURY. 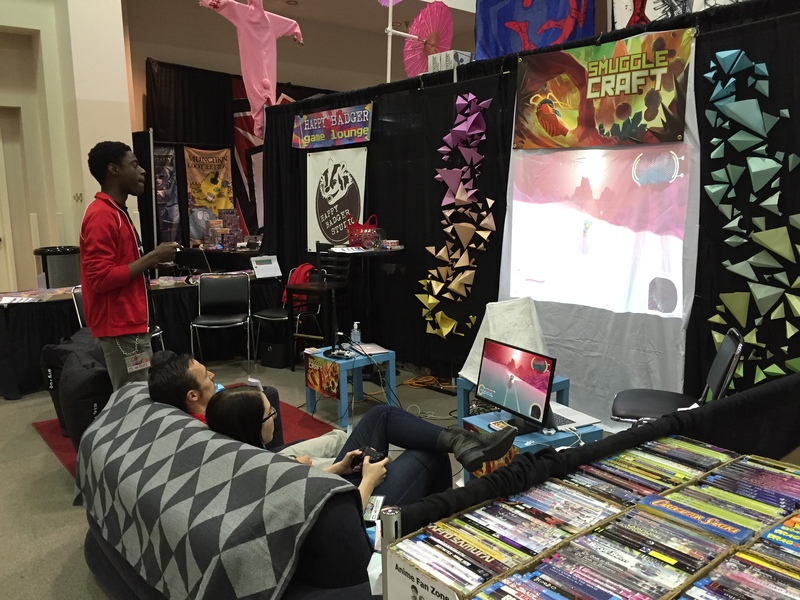 We’d recently demoed SmuggleCraft at Anime St. Louis, a mid-sized local anime convention, where we had a huge 20’x10’ corner booth space, an abundance of booth volunteers (like, eight, because of reasons), and plenty of amenities (free internet, parking, expo furniture, and electric), so we knew we were going to have to lower our expectations a bit for our Indy PopCon booth plans. We needed to scale down and decide what was important from the previous setup, and what could stay behind, knowing we would only have a 10’x10’ space and three people at the PopCon booth. 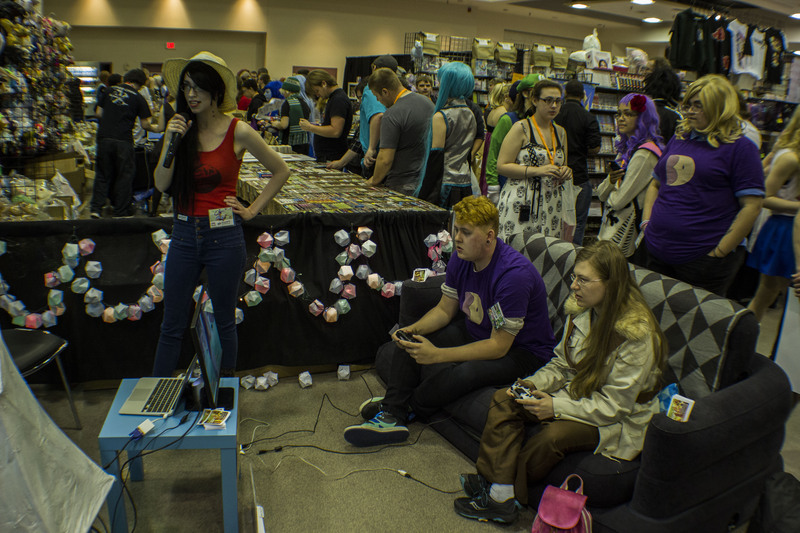 Since one of the most appealing aspects of our demo is the local competitive multiplayer mode, we felt it was important to have our big comfy inflatable couch return to the booth. Since the couch would be a primary focus, we designed our booth space around the 6’x3’ seating area, which would face a 32” TV that players would use. We chose to use our short-throw projector against the back of the booth so that visitors coming from either direction could easily see gameplay. We didn’t consider until we got to the convention, however, that the demo computer would need to be hooked to both the television and our short-throw projector via HDMI, so we spent most of Friday morning driving around Indianapolis looking for an electronics store that carried HDMI splitters. 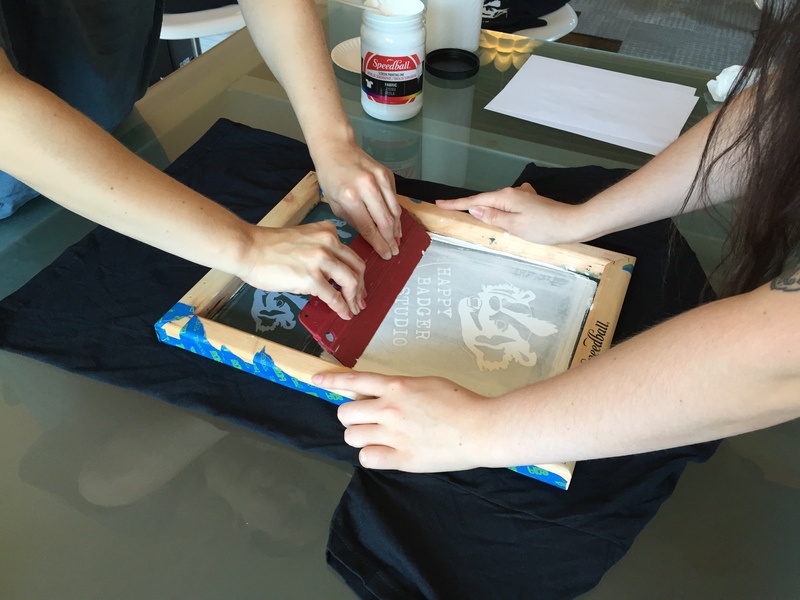 Indie Protip: Print your own t-shirts to save cash and cover yourself in paint! As far as handouts and promotional materials go, we already had a 4’ x 2’ SmuggleCraft banner, a handful of 9”x17” posters, 2.25” Happy Badger Studio buttons, and 500ish business-card-sized flyers printed for prior events, so all we had to worry about for PopCon was our signature Happy Badger Studio t-shirts. 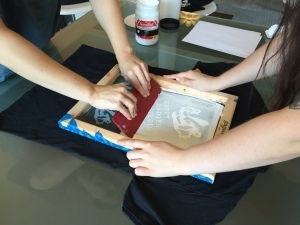 We hand-print our own t-shirts in the studio using handmade custom screens, so it’s pretty easy for us to keep the cost low. We purchased about 40 blank t-shirts ($12 per pack of 4 at a big-box store), a big tub of white screenprinting paint ($25), enlisted our intern Mila for an extra hand, and got to printing. It took about $150 and a day’s work for 40 t-shirts. See Mom? 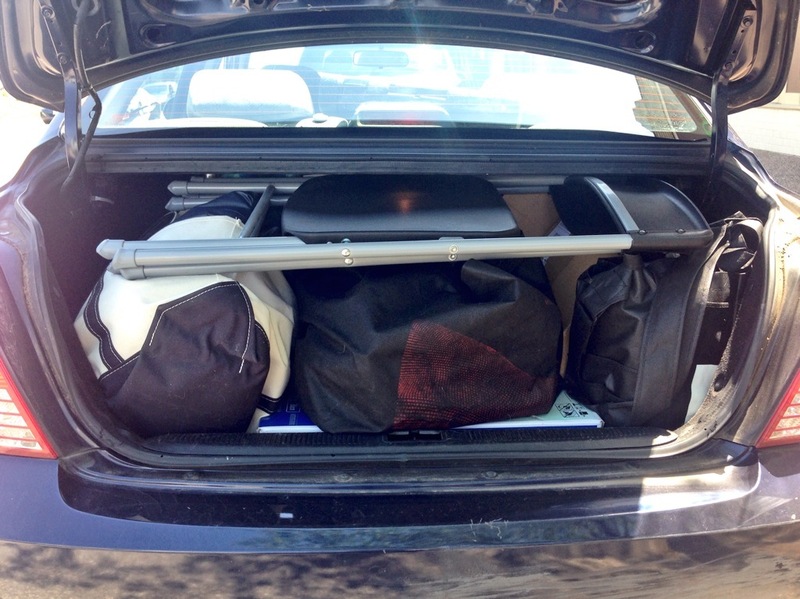 All those hours of Tetris DID come in handy. We arrived in Indianapolis on Thursday night with about an hour left to load in, so we got everything from the car and into the booth as quickly as possible (somehow it all fit in a wee Hyundai Elantra). We unloaded in one trip, blew up the couch, set up the TV and projector, and hung the SmuggleCraft banner (which we regretted getting without center grommets, only corner grommets). We decided we needed dowel rods to keep the bedsheet flat in place to act as the projector screen, so we held off on hanging it until we were able to make it to a local hardware store the next morning. We also used the extra time to take the sheet to the hotel to iron out the wrinkles as well as we could. 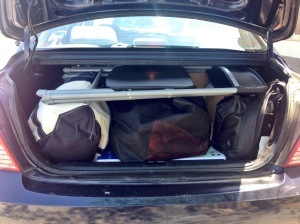 In total, it took about two or three hours to set everything up over the two days. Things we had that made setup way easier: large hooks (borrowed from the expo company), zip ties, tape (of various forms—two-sided, electrical, and duct are most useful), rubber bands, safety pins, binder clips, scissors, power strips, extension cords, scratch paper, pens/sharpies, and a tool set (mostly just for pliers and a screwdriver). We keep all the little stuff together with a handbag organizer, which helps a lot when it comes to finding small things. Dana, left, warms up the couch as I preside over the swag. We hoped to have two separate demos running at all times: one for players on the couch, and one for press and/or overflow, however we had framerate problems on our smaller laptops, so we stuck to the single demo station. We were at a high-traffic corner booth, so we discovered that having the television facing one pathway and the projection screen facing the other was a great way to draw people to the game. While the projection screen wasn’t perfectly flat or ideally lit (the lights in the expo hall were brii-iight), it was still visually interesting enough to get people intrigued enough to play. Now, let’s get to the important part: everyone loved The Couch. In fact, the reason I’m writing this is because our booth neighbor, Willy Chyr, liked The Couch so much that he suggested we do a postmortem on having a Booth With A Couch (thanks, Willy). 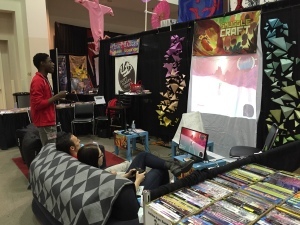 We added colorful throw pillows and a blanket because we felt it was important for our booth to feel like home; to hearken back to couch-centric local multiplayer days. 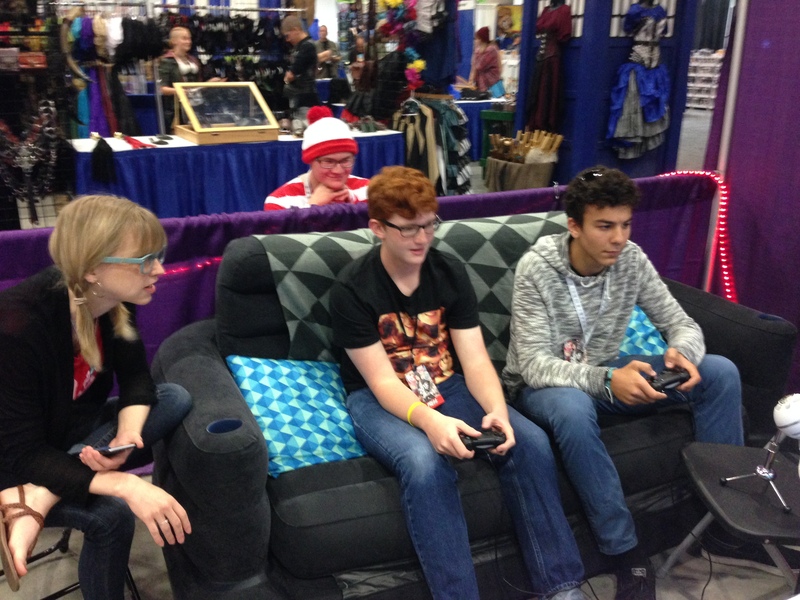 It brought an element of comfort to gameplay that is uncommon at convention booths, and we had a number of visitors return all weekend to duke it out with their friends on The Couch. One thing to note about inflatable couches, however, is that they are NOT accessible for all body types, so we strongly recommend you offer alternative seating for people who are more comfortable in sturdier chairs (which is precisely why we brought extra folding chairs). We gave t-shirts to especially enthusiastic players and friendly repeat visitors, and offered posters and buttons to anyone who played the demo or signed up for our mailing list. All of the freebies were very well received, and resulted in a lot of new friends and fans who couldn’t wait to proudly show off their shiny new SmuggleCraft poster. YouTube Let’s Players Bobert with a B (Center) and Coolio McJoe (Right) recorded themselves playing SmuggleCraft at our booth. Somehow I didn’t even see Waldo while I spectated. One thing that sets Indy PopCon apart from other comic and pop culture conventions is the sheer number of YouTubers and Let’s Players in attendance. PopCon did a great service to its exhibitors by sending a press list in advance, which we used to introduce ourselves, set up appointments, and start conversations before the convention. Through these conversations, we realized we wanted to be especially accommodating to on-site Let’s Players. We let them know that we had screen recording software and a Blue Snowball mic that they could use, as long as they brought their own storage device to save the video onto. It may not be as high quality as what they’re used to, but the few Let’s Players who took advantage of our recording tools were very grateful that we made it available to them. Prior to the convention, I worked up a spreadsheet summarizing our press appointments and various panel, podcast, and presentation times. Having this printed out as a physical copy at the booth was very helpful to keep us all organized and aware of who was coming and going when, without having to worry about constantly checking our phones for calendar notifications. We definitely could have cut back on costs for hotel and food, especially if our Airbnb hadn’t cancelled on us at the last minute or had we chosen to stay somewhere farther from the convention center. I should acknowledge that we like to indulge sometimes while traveling, which may be a bad habit, but we find the occasional drink and nice dinner helps relieve some of the stress of the convention. It would also be good to note that the $1000 for equipment was not all at once, as much of the equipment had already either been purchased for use in the studio (like the projector) or for previous events (like the couch); the total equipment cost in the breakdown is just to give you an idea of what you may expect to pay if you wanted to create a similar setup from scratch. The two main big-ticket items we bought specifically for PopCon were the 32” TV for $200 and the HDMI splitter for $100, both of which we intend to use regularly in the studio and at future conventions. The Couch only cost about $70, and has now valiantly survived six full days of considerable convention use. Thank you for your service, brave couch. I have a lot more detailed lists of expenses and equipment that I’m not including for the sake of avoiding information overload, but if you’re interested in a more detailed breakdown, feel free to email me. Overall, we had a really excellent time at Indy PopCon, and while it resulted in a more costly demo than we were expecting, it ultimately felt like a successful event for us. We met a lot of great new friends and fans, and now have a number of new contacts who are excited to keep their subscribers up to date on SmuggleCraft’s development progress. 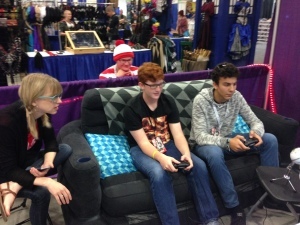 We’re looking forward to bringing The Couch back to Indy PopCon next year. 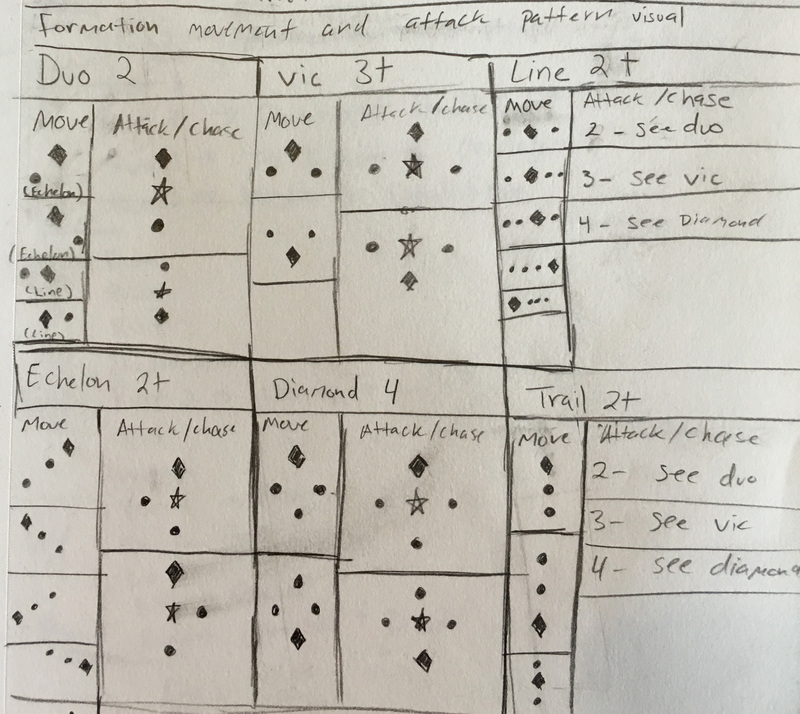 This blog is a cross-post from our SmuggleCraft Dev Blog. 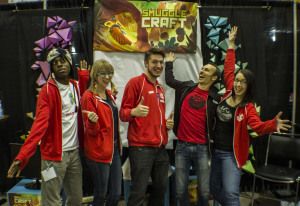 Ready to get your hands on SmuggleCraft? We’ve got another chance for you to play! Happy Badger Studio will be demoing SmuggleCraft at Indy PopCon in Indianapolis, Indiana this weekend, June 26-28. 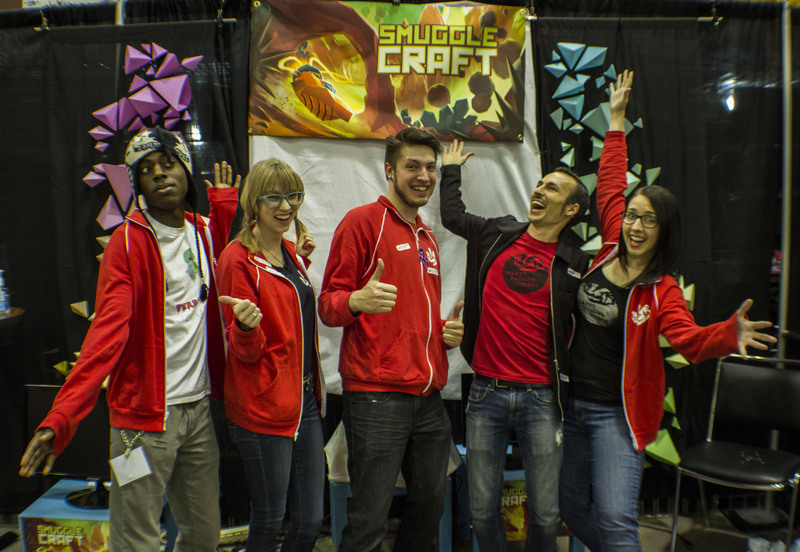 Come see us at Booth 346 in the vendor room to kick back and play the latest demo of SmuggleCraft. We’ll have both single-player campaign mode and two-player competitive mode going all weekend, so come play solo or with a friend (and, of course, we’re happy to challenge you to a multiplayer match too)! 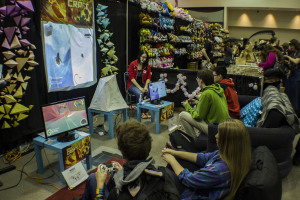 We’ll be hosting a SmuggleCraft mini-tournament on the Let’s Play stage from 4-4:45pm on Friday the 26th, so stop by our booth anytime Friday to sign up. Participants will get the opportunity to win a SmuggleCraft poster, a Happy Badger Studio t-shirt, or Happy Badger Studio buttons. And, of course, anyone who signs up gets to experience the excitement of participating in a tournament on the big screen! As if that wasn’t enough activity to get you excited, our own Carol Mertz will be speaking on a few panels over the course of the weekend. If you’re interested in learning about User Testing, Kickstarter, or the differences between Indie and Corporate development cultures, come see what Carol and the other panelists have to say! Huge news! We were excited to discover yesterday that, thanks to the help of friends, family, and fans, SmuggleCraft has been Greenlit on Steam! After just seven weeks on Greenlight, we received a lot of positive feedback, incredible support, and great encouragement. We know that Steam will be a great platform for SmuggleCraft, and have a brand new wave of energy to pump into the game’s development. If you’re looking for a chance to play SmuggleCraft, we’ll be demoing the game at a few upcoming events. We’ll be in attendance at the Saint Louis Science Center’s First Fridays event on Friday, June 5. We also just reserved game demo space at Indianapolis’ Indy PopCon from June 26-28. We hope to see you all there! We’ve just updated our Steam Greenlight page to show off the all-new SmuggleCraft First-Look Gameplay Trailer video! You’ll notice the aesthetic is a bit different from the original art test video we posted with our announcement. We’ve added in some gorgeous new lighting, track pieces, visual effects, and some stellar sound effects. You’ll also get a preview of the two-player split-screen competitive race mode. Take a look at the gameplay video below, and give us a vote on Greenlight to help us make Steam a reality for SmuggleCraft. 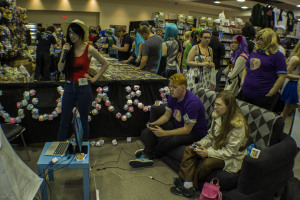 We were invited to Anime St. Louis, a huge local anime convention where we managed to transform our booth space into a SmuggleCraft-themed game lounge, complete with a couch, pillows, and cozy chairs. It was definitely one of the comfiest spots in the con. Carol commentates the final round of the tournament as Marceline the Vampire Queen, because why not? As a last-minute surprise, we managed to show off the all-new multiplayer mode for the first time ever, which people immediately gravitated to (though folks still definitely enjoyed the single-player campaign mode quite a bit; some even played for well over an hour). We hosted the very first (of hopefully many) SmuggleCraft multiplayer tournament, which saw over a dozen competitors and some intense gameplay. The final round boiled down to a very heated sudden-death! This guy Brian (left, on the couch) won the tournament, which was cool, especially since he had some rad Stephen Universe cosplay going on. We also had one of our very first demo reviews written, thanks to a writer from hardcoregamer.com who called it a “hovercraft joyride!” Consider us thoroughly flattered. All in all, it was an excellent event. Lots of people were glad to hear that not only is the game coming for Playstation 4, but also that the game is up on Steam Greenlight. A lot of folks promised to help us get the game some Greenlight votes, which gives us a lot of hope topped with some warm and fuzzy feelings. 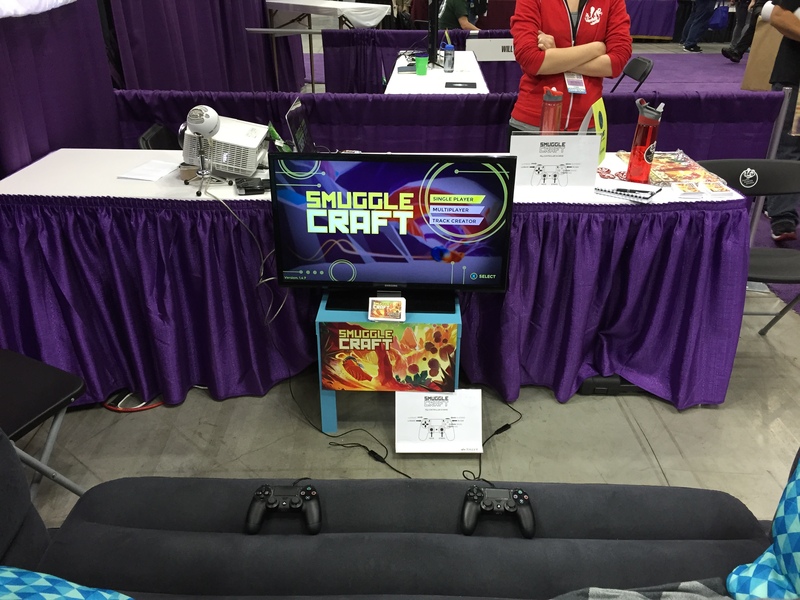 If you’ve been itching for an opportunity to play a demo of SmuggleCraft, now’s your chance! Happy Badger Studio will be demoing SmuggleCraft at Anime St. Louis in Collinsville, Illinois this weekend, April 17-19. Come see us at Booth 301-302 in the vendor room to kick back at the Badger Lounge while you play a shiny new build of SmuggleCraft. We’ll be debuting our two-player competitive mode for the first time ever, so bring a friend and come play! We’ll have a free raffle to be drawn at 5pm on Saturday and 3pm on Sunday, so make sure you come see us for a chance to win some goodies, including a prize basket and SmuggleCraft posters. We’ll also be hosting a SmuggleCraft multiplayer tournament at noon on Saturday, with a big prize basket for the winner! Hold onto your seats and get ready to race: we’d like to introduce you to SmuggleCraft, the next big game from our team here at Happy Badger Studio. We’ve decided to bring something totally new to the racing genre, because we know we can’t be the only ones who get kinda bored of driving in circles all the time. SmuggleCraft is a fast-paced hovercraft game with randomly generated tracks, a quest-driven branching narrative based on player choice, and fully modular upgradeable vehicles. In SmuggleCraft, you play Ferre Astraea, a smuggler simply trying to survive in a world that doesn’t make it easy. Dirah is a world in which travel, trade, and technology are highly regulated and virtually inaccessible for most; it’s a world in conflict, with many citizens struggling to survive while others willfully hide behind their own lavish lifestyles, all while revolutionaries fight for change. Meanwhile, you have a big debt to pay, a kickass hovercraft, and an opportunity to affect the fate of your society, for better or for worse. Gameplay is driven by player-selected missions complete with illegal contraband, high-speed chases, and valuable payouts. SmuggleCraft looks incredible, thanks to our talented artists Dana, Carol, and TJ, and sounds even better thanks to an original soundtrack by composer Bravendary (Phil Hayes, who also did the music for our previous games Strange Donuts vs. The World and Stodgy Gents). SmuggleCraft will be released on PlayStation®4 computer entertainment system, PC, Mac, and Linux in early 2016. It’s currently up on Steam Greenlight — we would love if you’d take a moment to vote for us and share it with your friends. There will be plenty of exciting announcements over the next year, so keep your eyes out for more news, assets, and dev blogs as we continue development!